Prepare delicious and healthy Beef recipes every day of the year! Tantalizing steaks sizzling on the grill, melt in your mouth fillet mignon kebab, heartwarming chilies and stews. Is your mouth watery yet? Beef is one of the most versatile protein there is and is overall rich in the nutrients our body needs. You can use in many different ways. 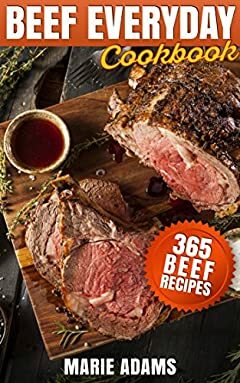 In this book, you will find 365 recipes where beef is the star ingredient. â€¢Facts and interesting information about beef, as well as health benefits of eating beef. â€¢Invaluable tips for preparing beef. ïƒ˜Delightful appetizer recipes like the Make-Ahead Sweet and Sour Meatballs and the Galangal Lime Beef Satay. ïƒ˜Comforting soup recipes like the Low Carbs Beef and Barley Soup and the Beef Tomato Macaroni Soup. ïƒ˜Refreshing salad recipes like the Beef Asparagus Salad with a Sweet Citrus Vinaigrette and the Roast Beef and Potato Salad. ïƒ˜Wholesome pasta recipes like the Rich Heritage Lasagna and the Pasta with Meat Sauce. ïƒ˜Marvelous stew and chili recipes like the Hungryman Stew and the Soulful Beef Chili. ïƒ˜Impressive main dish recipes like the ProvenÃ§al Beef Daube, the Slow Cooked Sauerbraten, the Szechuan Beef, the Italian Spiced Spinach Flank Steak, the Sweet Pineapple Teriyaki Beef, the Creamy Swiss Steak, the Steak Enchilada Casserole, the Thai Coconut Beef. Download today and enjoy reading on your favorite device like Kindle, IPad and IPhone, Androids tablets or cellular phones, laptops and even your computer with the free Amazon Kindle apps. Letâ€™s start cooking your favorite beef recipes! Scroll back up and click buy for an immediate download!